The South Capitol Street Corridor Project will dramatically change major street so that it becomes an inviting thoroughfare that leads people to the District's core. The question is will it be a good bridge for bicyclists and pedestrians? 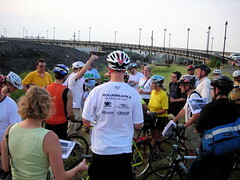 Officially called the South Capitol Street Final Environmental Impact Study (FEIS), a meeting will be held Tuesday, July 30, 2013 to discuss the current plans for the street, which includes the replacement of the Frederick Douglass Memorial Bridge, its approaches on both sides of the Anacostia River in Wards 6 and 8, and the rebuilding of highway interchanges at interstate 295 and the Suitland Parkway to its beginnings near the Capitol grounds. The South Capitol Street Corridor Project Information Update Meeting will be from 6:30 p.m. to 8:30 p.m. at the Capitol Skyline Hotel, 10 “I” Street, SW. The nearest Metrorail station is the Green Line (Navy Yard-Ballpark). Bike parking will be limited. This meeting is intended inform the public about changes to the design of the project based on the recommendations from the public made earlier in the process. The meeting will also discuss the project phases and schedule and allow comments on the bicycle-specific facilities included in the project. BAC invites you to this meeting so that you can add your concerns to the record. BAC issued comments in 2011 about this project to the District Department of Transportation (DDOT). While BAC supported many improvements associated with the project, the FEIS neglected to implement certain bicycle enhancements as well as improvements stipulated in the District of Columbia Bicycle Master Plan. Subsequently, DDOT made certain changes to the project and presented some of them at a recent BAC meeting. BAC Facilities Chair Jeanine Osborn (BAC-FAC@dcbac.org) hopes the changes include better accommodation for cyclists at both ends of the bridge, how bicycle and pedestrian facilities on the new bridge interact with streetcars, plans for connecting to the planned South Capitol trail trail, a timeframe of when the bridge and trail will be completed, a clear explanation of access to the Anacostia Metrorail Station from the new bridge better access to the Anacostia River and its trail, and better separation of bicyclists from motorist and pedestrians. Please feel free to provide comments or suggestions below and please consider attending.